*Killer second release on Mark Ernestus' and Mark Ainley's Dug Out reissue imprint. - Raw, stripped funk from the Black Ark,this is the Final Weapon rhythm - that signature cowbell, tough, scrubby guitar, bass bubbling deep in the pocket, and the Upsetter mixing live on the spot* The Dug Out label follows last weeks King Kong EP with a treasured artefact from the Black Ark. 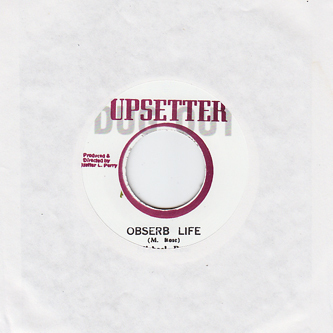 Michael Rose's 'Observe Life' features a lean production from Lee Perry on the Final Weapon riddim, all signature cowbells, tough scrubby guitar and bubbling bass arranged with the deft touch and charged atmosphere of the Upsetter. There's a lightness and agility to this cut that allows it to operates on the dual levels of the best reggae, both as a perfectly sculpted song, and an irresistable dancing groove. We're totally sold.